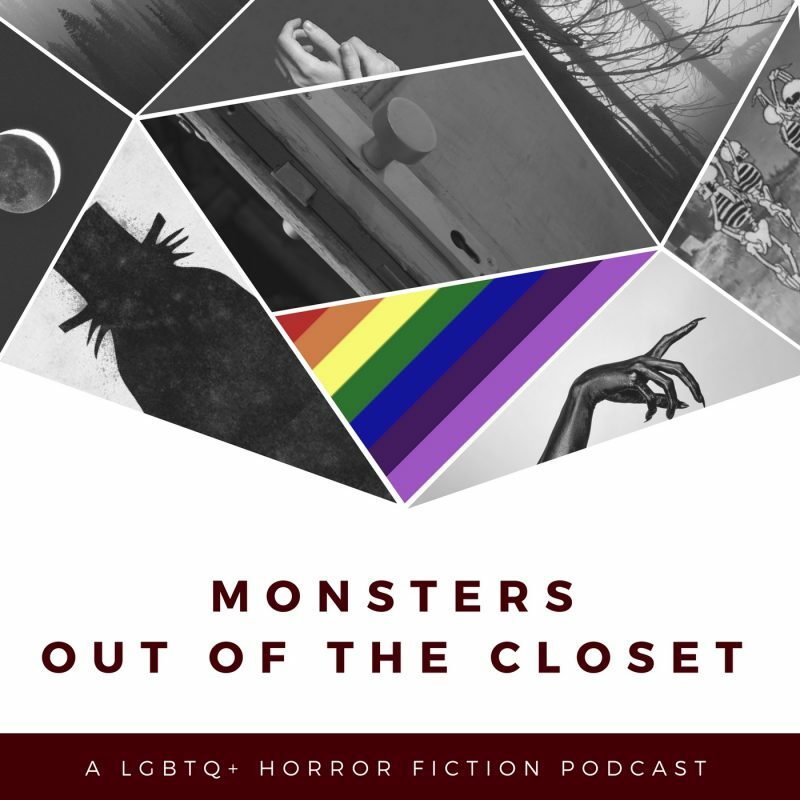 Monsters Out of the Closet is a horror podcast that focuses on fiction by LGBTQ+ creators. Songs, poems, stories, Monsters covers it all. A wide variety of voice actors and some creative effects add that atmosphere and tension that written word alone may not be able to add. Executive producers Nicole Calande (who’s over audio production) and Shriya Venkatesh, (who’s over content production) talked to GenderTerror about their trials, tribulations, inspirations, and overall goals with the podcast during its first year. GenderTerror: How did the team all get to know each other? Shriya: Nicole and I met as first-year counselors at a summer science and tech camp in the San Francisco Bay Area. We became really good friends that first year, and we clicked even more once we both figured out the other was not-straight the year after. Nicole: After getting to know each other at camp, our friendship deepened by sharing and exchanging books, movies, and even fanfiction. In one of our first ever collaborations a few years back, Shriya actually beta-read some of my fanfic. GT: Why did Monsters Out of the Closet come to be? S: Nicole and I had kept up a (mostly irregular) long-distance conversation while we finished out undergrad, and at some point we started talking about horror. And I remember that we both felt that there simply wasn’t a lot of horror content out there that was even friendly to LGBTQ folks, forget about finding stuff that was made by people in the community. Nicole was the one who suggested that we try to fill some of that gap ourselves, and here we are, almost two years later! N: After the 2016 election, I was drained as far as activism was concerned. I burnt myself out, and all I had left was my art. I wanted to create something for myself, and I was eager to collaborate with someone who could help make a meaningful project. Of course, when Shriya reached out, I knew we had to work together. We knew there would probably be some writing and stories involved, but I was on the heels of taking a film theory class in college focused on horror and was still thinking about it. I had been stewing in all this queer subtext I had never thought of or noticed before, and it wasn’t long until we figured out this idea of reclaiming horror in podcast form. GT: What does queer horror mean to you? S: I would say LGBTQ horror is horror made for us and/or by us – us being the LGBTQ community. There’s certainly a lot of horror that appeals to the community – I think because it’s a genre in which you can more easily play with social boundaries of gender and sexuality – but I guess I’m a bit of a purist in this matter. I think the real-life people involved or served are crucial, and just having thematic elements doesn’t cut it. N: I live in Portland, and there’s a bi-monthly Queer Horror film series, and they do a great job of articulating what they see as “queer horror” and I agree with their vision. This film series features movies that (1) have prominent LGBTQ+ folks either behind the camera, (2) in front of the camera, or (3) contribute to a “queer horror aesthetic” (for aesthetic, think Death Becomes Her, The Craft, or Addams Family Values). For me, my favorite queer horror is about seeing something of yourself reflected in art, and sometimes that even means I’m gay and I like this spooky thing, so *bam* that’s “queer horror”. GT: How do you go about deciding what themes to cover? N: Shriya and I work together to come up with themes. Usually we go with a plot element, a feeling, or words that can be read in a variety of ways. It is somewhat random, but for our first year we tried to aspire towards themes that resonated with the month in some way, like Endings in December, Secrets in spite of Valentine’s Day, and Liberate for Pride Month. For our second year, we’ve tried to a be less abstract with our themes with choices like Alien, Gothic, Vengeance. S: I agree a lot with Nicole. We toss a bunch of ideas around and see what sticks and what we both agree is evocative enough. GT: What have you learned in your first year of podcasting? S: So much! It’s definitely taught me some hard lessons about organization. But I think something really valuable that’s come to me out of this project is a sense of legacy. Even with only about a year’s worth of content out, I think we have had to dig deep to figure out what kind of space we want this podcast to occupy and what kind of role we see us playing in our community. For the past several years, I personally have really only been thinking a year at a time, and being part of something as meaningful and with as much potential as Monsters has made me look at the bigger picture and the longer term. N: Some of my greatest lessons have been technical and organizational ones, from sound design to building the podcast’s brand through graphic design and social media. Additionally, I feel like we’ve learned a lot about starting a podcast by what we didn’t know to do in our first year. For example, if you want to start a podcast, it helps to already have a long episode backlog prepared and money for artists before you launch. We’ve spent a long year just scraping by, getting from episode to episode. But now that we’ve secured funding to backpay our artists and having received more submissions well in-advance of episode release, it gives us the chance to actually start in our larger plans for the podcast. GT: Favorite type of media to cover since you have plays, songs, stories, poems, etc? S: I’m a poet and song-writer, so of course I have a soft spot for the poetry and music that we feature. I agree that incorporating music into an episode just pushes it that extra distance and helps establish the horror ambiance. And poetry is much the same – you’re hit with so much imagery and feeling that it becomes an immersive experience. N: I personally love the musical compositions—they just lift an entire episode. And even though they are so much work, I love the audio plays. There’s a lot of steps, from working with the voice actors, to getting sound effects together, but when you hear everything fall into place, it’s a really rewarding feeling. S: I really can’t choose! But I think an important landmark for us was our first audio play – Garden, by Lucille Valentine – which turned really opened up the boundaries on what kinds of content we could feature. Since Garden, some of our most compelling pieces have been audio plays, and I’m excited to see what new kinds of content we can have in the next year. N: It’s really hard to single out favorite episodes or favorite pieces because there are some many amazing elements that we are all proud of. But there are a couple of notable examples that spring to mind. From an audio design standpoint, “Garden” by Lucille Valentine, “Swipe Left by Zombies” (by me! ), and “Little Leap of Logic” by Ada Dela Cruz were all pieces that featured new opportunities in audio production and sound design that really paid off in the final pieces. I’ve also loved Ross Crean’s compositions that they’ve submitted to us, as well as Shriya’s song, “Rust,” which I still sing to myself. I lastly have to give a shout-out to Sarah Schaff for her kickass poetry that I’ve been showcasing since college and have been thrilled to feature here as well. GT: Personal horror influences and favorite types of horror? S: I don’t know if anyone else on the planet remembers this, but there was once a Disney Channel movie which had this idea that forgotten imaginary friends eventually turn into boogeymen to…eat children or something. I remember very clearly being genuinely terrified by a scene in that movie which shows an imaginary friend caught in the middle of this transformation, slowly clawing his way up the stairs to the protagonist’s bedroom. That experience really cemented for me this idea that horror comes from helplessness, and I think that’s something that still gets me today. Poe’s short stories got me more involved in the slow-vengeance, gothic ambiance-type of horror. Stuff like The Twilight Zone also helped me catch on to the more unsettling types of horror. And of course, your have horror with a healthy helping of humor in material like The Addams Family. But my favorite type of horror is stuff like Carrie, or even The Witch, where a girl eventually gets to wreak havoc with her horrifying powers. N: I really love smart found-footage and mockumentary horror films like UFO Abduction (the McPherson tape) and The Tunnels. I’ve recently been getting into more cerebral and emotional stuff like The Witch, The Ritual, or Hereditary. I love spooky podcasts like Welcome to Night Vale, Lore, and The Black Tapes. I am a sucker for ghosthunting and paranormal investigation shows, most recently BuzzFeed Unsolved. Most of my absolute favorite horror “classics” are Edgar Allen Poe, Shirley Jackson, The Twilight Zone, The Shining, Goosebumps and Scary Stories to Tell in the Dark. Some of the new classics that I feel personally inspired and influenced by are Get Out and Her Body and Other Parties, a short story collection by Carmen Maria Machado that you just have to read. Anything vaguely Gothic or dabbling in the liminal—I’m in. GT: What do you see as your role in the queer horror community? S: It’s exciting to do this project as a podcast because podcasting is so accessible from the ground floor. Within our first year, Nicole’s already been to Podcon and met some really fabulous people with great advice, like Lucille Valentine (@severelytrans) and the podcasters at Spirits (@SpiritsPodcast). It’s fantastic that we can have experiences like that as a team that’s just starting out. And, as for horror, it’s amazing to communicate with others in the horror genre (like GenderTerror and Graveyard Shift Sisters) who are committed to bringing diversity out of the “niches” of the genre and into the light. As radical as it was when a teenage girl invented the genre, the mainstream has been dominated by straight, cis white men for such a long time. But in this newer generation of horror, creators of color, women, and LGBT folks are getting more of a platform, and we’re generating some incredible content and a lot of good commentary. We would love to do work like that as part of this wave of change – make horror a more welcoming place by making space for new voices and audiences. Be sure to check out the Tumblr, Twitter, and Patreon! Shriya Venkatesh is a science teacher in Los Angeles and a horror fan all across the internet. She writes poetry, songs, and strange combinations of the two for Monsters Out of the Closet and other projects. She would LOVE to talk about the dark places where the horror genre and the real world intersect – you just have to find her first. Nicole Calande is a writer currently based in Portland, OR. When she’s not working at a marketing firm, her local bookstore, or an independent publishing company, she loves enjoying media, podcasting, and writing short stories and longer pieces. You can reach her on Twitter @NicoleCalande.